After one year of Chris Yost, Red Robin gets a new writer, or I suppose, a returning writer, in the form of Fabian Nicieza. In Red Robin #13, Nicieza’s first issue, Red Robin, Batman, and Robin run around Gotham City while Tim muses about right this all feels. They go off to respond to different crises, with Tim heading off to deal with the new Lynx and her gang. Based on info Damian gives, he tries out his new glider, but Damian was off with the wind speed, so his arrival is less than graceful. Lynx’s forces retreat when he arrives, and he finds a couple of corrupt cops that he thought he had gotten rid of waltzing around. Lynx yells at her crew for starting the fight, and Tim realizes that she was brought in by someone else to run this group. Later, Tim wonders about what his plans for the future are. He meets with Lucius Fox and his two daughters Tiffany and Tam to talk about the engagement scandal (Fox has the article framed in his office) and to talk about some mysterious plan of Tim’s. Tim and Tam talk about their own problems, then later that night, Tim grabs one of Lynx’s goons to lure her out. He beats her in a deliberately over-the-top fight, but when he’s about to toss her to the police, she claims that she’s an undercover police officer from Hong Kong. He decides that he doesn’t care and hands her over anyway. Tim later talks to Damian and Alfred Pennyworth about his plans, and there’s a massive display on a computer screen behind Tim of various bad guys, some known, and some unknown (Scarab and Moneyspider?). Seems Tim has a master plan about dealing with Gotham City’s evils. Well, if that wasn’t a nice change of pace, I don’t know what was. Instead of brooding, secretive Tim, we now get someone who’s willing to work with the team, someone who actually fits in the new status quo. You know, just in time for Bruce Wayne to come back. But seriously, Nicieza’s work is already making a big difference on this title. Tim seems a lot more driven in a positive way than before, and I’m interested to see some of these new bad guys. Nicieza seems to be continuing his plan from before to improve Tim’s rogues’ gallery, which I certainly don’t mind. I’m also interested in the new Lynx. As Damian pointed out, she did help out the Batman family in a few recent jams, so she seems to be a nice gray character. Hopefully we’ll learn more about her later. My main problem is a holdover from Yost’s run, Tam Fox. She was just shoved into this story from day one, and I feel like more stuff with the Teen Titans, Batgirl, or his old girlfriend Zoe would be more organic. But Nicieza’s just working with the cards he’s been dealt, and it would be rather awkward to just toss her away so abruptly. Especially if my hunch is right. Still hope that the Teen Titans show up soon. Unfortunately, Marcus To is still as boring an artist as ever. 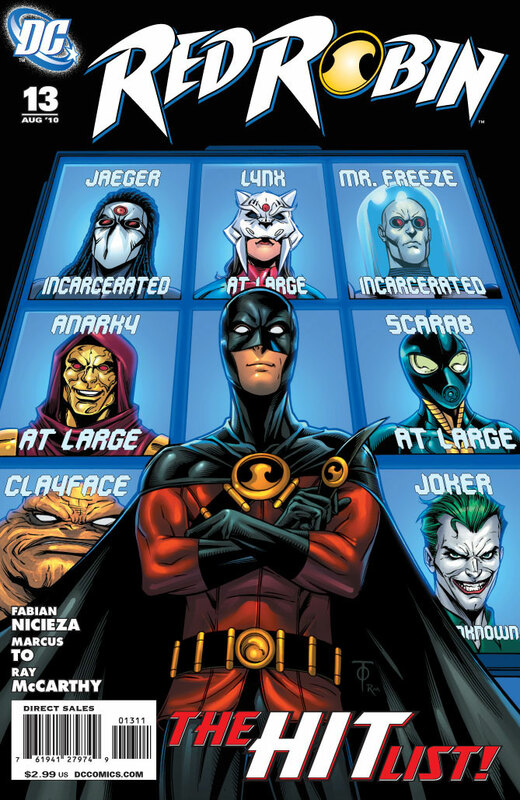 First of all, Tim’s wearing the wrong Red Robin costume on the cover. Just saying. And since when did he use Red Robinarangs anyway? As for almost everything else, it’s, well, boring. The fight with Lynx isn’t terribly exciting. And it’s not like the rest of his work is very sharp. It’s sound, but it doesn’t have much energy. Also, why does that officer have her shirt unbuttoned so low? I mean, that’s just blatantly sexist right there. Also, small coloring mistake with that goon’s hair in one panel. It turned from white to black. Anyway, I’m a bit more optimistic about the future of Tim Drake with this. It’s not the stellar new start I would have hoped for, but it’s definitely a step in the right direction. Just wish the artist would change.